This article in the Guardian about Detroit’s minimum wage economy cites a Detroit-area graduate student, Alex Hill, who ran numbers to show that “while almost 83 percent of Detroit is black, just under 70 percent of its commercial revitalization is led by white residents.” The NPQ Newswire has been making just this point for quite a while: Despite the best intentions of many of the political and philanthropic actors engaged in saving Detroit from bankruptcy, the revival of Detroit, the largely black city with a 39 percent poverty rate, is leaving many current Detroiters on the curb. Detroiters who have found or scrounged for jobs, when they get them, often work for minimum wage or barely above it in the retail and fast-food industries. “To be sure, Detroit’s ‘renewal’ is overwhelmingly white,” concludes the Guardian’s Rose Hackman. Relegating large parts of the Detroit population to sub-living-wage semi-employment while the revitalization prompted by investments by the likes of Dan Gilbert of Quicken Loans (who has been acquiring swaths of downtown office buildings) or such foundation consortia as the New Economy Initiative attracts and benefits outsiders is a difficult and imbalanced revitalization scenario with unfortunate racial overtones. Due to the lack of good jobs, especially with the withdrawal of the automobile industry from Detroit, Sarah Swider, an assistant professor of sociology at Detroit’s Wayne State University, suggests that Detroiters are finding themselves stuck with jobs in the “informal economy.” These jobs in car washes, food service, daycare services, beauty and hair care, etc., are often part-time and generally very low wage, with no benefits and no taxes withheld. Sometimes, the informal economy jobs don’t even operate on a cash basis, more like barter than employment. An organization called “Detroit15,” or “D15,” is organizing Detroiters in a campaign for a $15 minimum wage, almost double Michigan’s minimum wage of $7.40 an hour, modeled after the minimum wage standards enacted in San Francisco and Seattle. The emphasis of Detroit15 seems to be the fast food industry, which is targeted to increase hugely in the metro Detroit area. On the group’s website, the link to its Facebook postings is heavy with images of and reports on the McDonald’s hamburger restaurants, whose clientele might not react adversely if they were paying more for their burgers and fries so that counter staff and cooks were better paid. 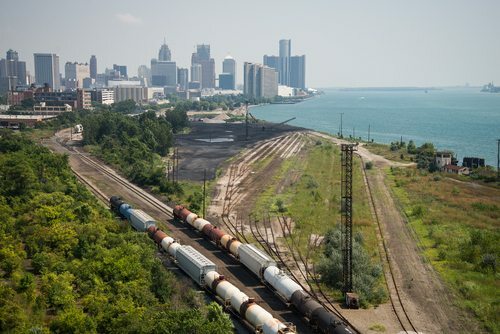 Critics, however, probably respond that a $15 minimum wage might work for burgeoning high-income cities on the West Coast but not for getting Detroit’s armies of poor people into jobs. For his pre-State of the Union tour, President Obama visited Detroit yesterday to talk about jobs. Swider suggests that the real unemployment rate in Detroit is something like 40 percent. What might this large proportion of Detroit have thought when President Obama explained that the nation’s economy is on the rebound, that the unemployment rate is falling, and that the trendlines are positive? It’s certainly not a story that describes the region’s automobile manufacturing situation, with only one auto assembly plant still operating in Detroit. In fact, as President Obama headed to Detroit, there were news reports about the assemblage of one home, manufactured at a General Motors assembly plant, to be placed on a nonprofit organization’s Detroit urban farming site in the spring. The home is inside a shipping or storage container, which will give the occupant roughly 320 sq. ft. of living space, perfect maybe for a university student, but not a viable replacement for the dilapidated Detroit housing stock and not much of a job generator for underemployed and unemployed Detroit residents.